Many 3-D computer games invite you to explore a virtual space, but few so far have conjured the experience of travel. Sure, geography trivia games send you from Nashville to Norway, Bonaire to Zimbabwe, looking for Carmen Sandiego. And every MMOG makes you tramp across three maps to kill 30 rats. But this gameplay captures no more of the travel experience than a back-seat game of Highway Alphabet. You're lost and thirsty in downtown Nairobi, Kenya, under a sun that would scorch tar. On a city road so bad all the potholes have joined, leaving isolated mesas of pavement, you see a crowded wooden shack with a hand-drawn sign: TEA. You enter, and in a heartbeat, 30 people fall dead silent. You feel their stares. Sipping from a dirty glass, carefully avoiding eye contact with a roomful of people who seem inexplicably nervous, you realize you're likely this shop's very first white customer. In a nearly empty night bus rattling through rural Java toward Semarang, passengers amble over and sit right next to you, as close as possible; that's courtesy in Indonesia. After midnight, at the turnoff to Yogyakarta, the bus drops you off in some unknown village where nobody speaks any English at all - and I mean none. By the time you find a bicycle-rickshaw driver, a guest house, the bus station and the right bemo south - all without a guidebook - you feel you're in an old-style Sierra adventure game, putting the tape on the fence to get the cat fur to make the mustache to match the passport. Walking down a village road in Cappadocia toward one of Turkey's underground cities, you stop to talk to a child - or rather, not talk, because here again nobody speaks English. After a few moments, her parents invite you into their house; that's courtesy in Muslim societies. The whole family gathers round to serve you black tea, goat cheese and home-grown olives. You have no way to talk, so you just size each other up and enjoy the conviviality. Later, back at your pension, you fall delirious with food poisoning. I can almost visualize experiences like these (minus the delirium) happening in a computer game. Yet I've never seen a game simulate anything like these incidents, which happened to me on seven-month backpacking trips around the world (1992-93) and across sub-Saharan Africa (1998-99). In my otherwise humdrum life these trips were high points and low points, bringing out in me the best and worst. Travel isn't inherently good or bad, but it's definitely extreme. It's life with all the knobs turned up. Travel doesn't feel like a story or movie, where you passively observe. Rather, in every moment you're actively figuring or doing or dodging - just like in a good game. 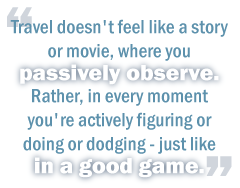 Games and travel: In certain ways they're the same thrill. Developers have seldom tried for that feeling. But it's possible this may soon change.